Save space, time, and resources with the wireless-capable OfficeJet Pro 9025 All-in-One Inkjet Printer from HP, which packs printing, scanning, copying, and faxing into a single unit. This model has two, 250-sheet paper trays for handling large jobs and is eligible for HP's Instant Ink Program, so users will always have a fresh cartridge when needed. At its core, the 9025 is an excellent printer with a print resolution of 4800 x 1200 dpi and ISO print speeds as fast as 24 ppm in black and 20 ppm in color. Borderless printing is available on documents up to 8.5 x 11" and for printing non-borderless documents the printer accepts media up to 8.5 x 14". For copying and scanning the unit has a 1200 dpi CSI scanner, and for multi-page documents the ADF has a 35-sheet capacity. Equipped with built-in Wi-Fi and Ethernet connectivity the 9025 can be added to an existing network with ease, and all of these settings and modes can be intuitively accessed via the 2.65" Color Graphic Display (CGD) touchscreen on the front panel. Wi-Fi Direct features allow users to connect directly from mobile devices for immediate printing needs, while it is compatible with many services for working seamlessly with a variety of devices. For those desiring a direct, simple connection a USB 2.0 port is available. Box Dimensions (LxWxH) 19.0 x 19.0 x 14.5"
OfficeJet Pro 9025 All-in-One Printer is rated 4.7 out of 5 by 19. Rated 5 out of 5 by Zbinxx888 from Lightning Fast and Beautiful Color I have a small home business where I do a lot of printing. The HP 9020 is the best printer I have ever worked with. It`s lighting fast and quiet. I tried printing a few photos as well and it rivaled ones I have had printed at photo centers. The colors are very true to the original and there is no pixelation or lines like I have seen with other printers. The set-up was extremely easy. I downloaded the HP smart app and connected the printer to WiFi and it did everything else all on it`s own. The size of the printer is compact and fits well in my space. I think the price is reasonable for how well this machine performs. I am extremely impressed with the HP 9020 and am looking forward to using it for years to come. Rated 5 out of 5 by RichKahmercom from Great Printer For A Small Office Our previous printer stopped working when we upgraded to Windows 10. This HP OfficeJet Pro has been a great replacement! Myself and the staff really like the ability to print from anywhere. It was easy to setup and connected to our WiFi quickly. Will be purchasing another one for our other office in the near future. Rated 5 out of 5 by Chula48 from Quick and Quiet The HP OfficeJet Pro 9025 may be my favorite printer yet.After downloading the HP Smart app it was a breeze to set up. It`s sleek,smooth square design is modern enough to blend into any type of environment .It`s not too big and not as heavy as other printers I have owned.The print quality is exceptional.My favorite feature is how quiet it is compared to other printers.Sometimes I check to make sure it`s really printing. I love the control panel and how I can check on work I`ve done through it.I love that mobile printing is so easy to utilize through the HP Smart app and that I have the option to send documents to my email,the Cloud or to print.The Smart Tasks option is definitely a plus. 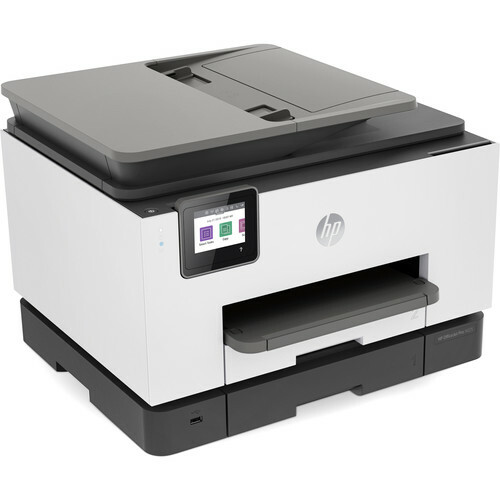 I also love that it runs seamlessly with my HP computer.I haven`t used all of this printer`s features but am looking forward to it. All in all the HP 9025 is at the top of it`s class .Whether it`s for the workplace or a home office ,I would surely recommend this to anyone and everyone that wants to speed up productivity while maintaining good quality documents at the same time. Rated 5 out of 5 by Franb22 from Smoother than ever The Office-jet Pro 9020 Series is a thing of beauty. Immediately upon unwrapping we liked it. It is well constructed with a muted elegance about it. You can also tell that the materials aren`t cheap. The printer was very easy to set up and is very user-friendly. Scanner, copier and Fax work perfectly. We are really excited about the super convenient features of WiFi printing and the ability to print directly from our phones, or email documents to the printer to print. Printers like these with these types of features usually take a while to print, and are generally in monochrome. The fact that printer is in full color and prints pretty quickly only adds to its overall capabilities. Pros: Very easy to set up and use. Surprisingly fast.Most convenient printer we`ve ever owned. (wireless, Mobile, and email printing)Full brilliant color.Sleek design.Cons:A bit bulky. Perhaps rounded corners would address that. Summary:This is definitely a next-generation printer. In this printer you pretty much get everything you want in an all-in-one workhorse, and then some! Rated 5 out of 5 by LoriCheek from A Perfect All in One Printer This printer was an absolute breeze to set up. It took less than 10 minutes and I was ready to go. It prints and scans from any of your devices and the connected app makes the process seamless. You can even email documents to the printer to print. It`s overall a very easy printer to use and the quality of the print jobs were perfect. I highly recommend this printer for home or office use. Rated 5 out of 5 by Familyprinter from Great modern printer & scanner I received this product in exchange for my unbiased opinion. I haven`t set up a printer or scanner for a few years and I am surprised how easy it has become to do. At least with HP OfficeJet Pro 9025 printer. I had some difficulty with the mechanical part because you need to put in a blue and red cartridge than put in yellow one till you hear a click; then put black one; then push blue and red cartridges further inside to make them sit at the yellow cartridge level. I didn`t do this part well, the printer "told" me what was wrong through the screen, I adjusted cartridges and it works. Everything else was painless.First, you need to set up a wifi connection. I did it through the iPad app and everything went automatically, I neede to push just one button. After the printer was connected to wifi I connected a laptop, a desktop, a tablet (both with ios), and phone (android based) less than in 10 minutes. For laptop and desktop computer you need nothing, just add a printer and the process will continue automatically. For a tablet and phone, you need to upload an HP smart app. I like the following functions of the device:- it both prints and scans;- it does double-sided printing & scanning; - you can print from a computer, mobile phone or tablet;- you can scan to send the scanned file in the email;- you can take a picture and print it instantly;- you can print from google docs;- you can save the task you do frequently (for example if you scan and send documents for the same recipient every week) and then use one button to perform it.It is very easy to print or scan from a mobile device through the app. The only thing I didn`t figure out yet how to do double-sided scanning from the mobile device.Make sure you choose the high resolution for scanning any file with pictures or diagrams in it. The HP app is set up for 200 dpi which is ok but on the laptop and desktop default 75 dpi set up wasn`t working well even for text files, I had to adjust it. Rated 2 out of 5 by SallyMM from Output Tray only holds 35-50 sheets!!!! Output Tray only holds 35-50 sheets!!!! This is massively inconvenient for someone who prints 160 sheets at a time, almost bad enough to make me want to return this otherwise very nice printer. Rated 5 out of 5 by doughoenig from HP OfficeJet - printing made easy and efficient I don`t buy new printers very often, but when I do, I care about having the latest features. This one has impressed me and I`m happy with it. Connectivity: this printer is pretty cool how connected it is. It`s not even connected via any hard wires. No need to plug in or unplug as you move your laptop about your house. The mobile connectivity is very impressive too. My printer has it`s own name and email and I can send files to the printer when i`m remote so they`re sitting there waiting for me. This is definitely my favorite feature.Utility: This printer will make my life easier when it comes to work admin stuff like doing expenses. I can quickly send files from my phone (expenses, receipts, etc) to my printer. Super excited how this will cut down time on things like this. Quick: It prints very quick. Assembly: This printer was very easy to assemble and setup for use. Just follow the easy to read instructions and you`re good to go. Competitive: Compared to past printers I`ve had and used, this is certainly up there as far as feature sets and providing what I need, and then some. Overall, I`m impressed with the new HP OfficeJet Pro 9025 and am very pleased with having it.